Following the previous post (BSAO Text formating – part 1), I’ll discuss the challenges and proposed solution to get all line breaks form SAP pong texts to the Ariba Network Comments section. In this example, I’ll show how to map the texts on the cXML Comments tag, but this can easily be used to map the long texts to different cXML tags and extrinsics. Previously we saw that on BADI ARBERP_BADI_OUTB_MAP, method FORMAT_COMMENTS we can only add text to the beginning and end of each Text ID, but we cannot control the text content itself. We can however, change the Comments content is on the document mapping methods from BADI ARBERP_BADI_OUTB_MAP. Let us take it for instance the Purchase Order mapping method MAP_BUS2012_TO_ORDR_OUT. We could rewrite the standard logic mapping the PO Texts ID to the AN Comments here, but then we would lose the Configuration options of mapping the Text Ids, and what we already implemented on the FORMAT_COMMENTS BADI method. Instead, I decided to leverage what the standard Add-on code does, and change only the line breaker character. The line breaker is a space character on the default code. I would it to be a line break character instead (cl_abap_char_utilities=>cr_lf). We can use this solution to map the long text of any type of outbound document to the Ariba Network. This solution may also be used if the customer wants the long texts split into extrinsic on the Ariba Network cXML document. 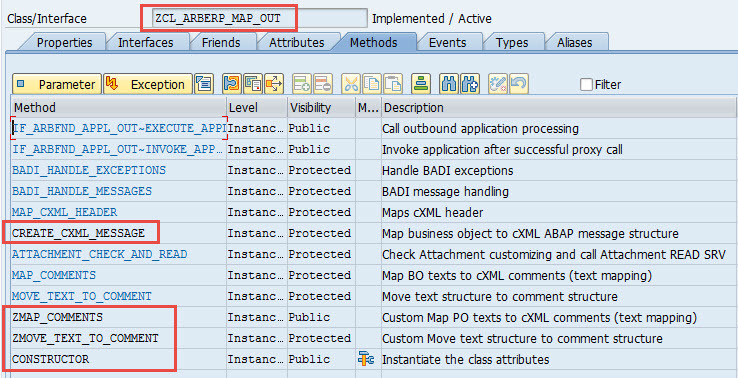 The text mapping from Text ID to the Ariba Comments string takes place on the Class CL_ARBERP_MAP_OUT. Method MOVE_TEXT_TO_COMMENT concatenates the text lines for each Text ID to a string. It also call the FORMAT_COMMENTS BADI method. Here is the piece of code I would like to replace the <space> for <line break> as the line break separator. Method, MAP_COMMENTS, receives the PO Text tables (header or item), filter what was setup on the Configuration (SPRO Activity: “Map Texts of SAP ERP and Ariba Network”), and calls MOVE_TEXT_TO_COMMENT. Here I only want to call the updated method MOVE_TEXT_TO_COMMENT. Create a Z class inheriting form CL_ARBERP_MAP_OUT, as public. Ideally, I would be able to redefine methods MOVE_TEXT_TO_COMMENT and MAP_COMMENTS on my Z class to achieve what we want. However, the developers were nice enough to define these methods as final, so we cannot redefine them. Instead, I had to create the ZMAP_COMMENTS and ZMOVE_TEXT_TO_COMMENT as a copy of the original methods. Here is the snippet of the addition to method ZMOVE_TEXT_TO_COMMENT. * when we get a paragraph, we will concatenate the break line. CONCATENATE lv_comment_content ls_text-tdline INTO lv_comment_content SEPARATED BY cl_abap_char_utilities=>cr_lf. Here is the snippet that was added to method ZMAP_COMMENTS. This code will instantiate the helper classes, making the text mapping methods work as expected (getting the Configuration data and calling the FORMAT_COMMENTS BADI method. The final piece of the puzzle is now to call my Z class inside the Outbound Document BADI. Is this example, the PO mapping method. We need to read the PO data, map the Header and Item texts to the corresponding structures, call the Z class ZMAP_COMMENTS method and map the result to the corresponding cXML Comments sections. The sipper bellow will do just that. LOOP AT lt_htext INTO ls_htext. CREATE OBJECT lo_text_map TYPE ZCL_ARBERP_MAP_OUT. READ TABLE lt_final_text INDEX 1 INTO ls_final_text. LOOP AT lt_itext INTO ls_itext. LOOP AT CS_ORDR-REQUEST-ORDER_REQUEST-ITEM_OUT ASSIGNING <fs_item>. The result of this customization on the Ariba Network will look like something like this. Note that all paragraphs inserted on SAP long texts are maintained, and AN UI will automatically format the extra line breaks (not paragraphs) depending on the screen size.